How to get started in Metal Detecting. Modern Clad Coinage, Old and New. Old Jewelry, New Jewelry, great finds. Bottles, Containers, and Jars, Oh My! Links to other good sites. Hi! Welcome to my site. This is my hobby, metal detecting, I hope you enjoy it. Thanks for checking it out. Metal detecting to me is a very fun hobby. It is a hobby that you can do alone or with a friend, and the best part of it is that you never know what's going to come out of the ground. That's the thrill of metal detecting, and you can learn a lot about the past too. Please allow time for items on the pages to load on your computer. This will give you a chance to enjoy this site to the fullest it has to offer. Thanks. Also, please sign my guestbook and let me know what you think of this site. If you have your own web site, please leave a link, so others can check out your site too. Feel free to e-mail me if you wish to contribute to this site with your own tips. Without the support of advertisers, this site wouldn't be possible. Please show support by clicking on them. Thank you. I would like to thank Randy Iwen of MongoBay.com for the awesome prize I won at his site. It's a Garrett's Predator III Metal Detector. I've been having a fun time detecting with this little gem of a detector. I would recommend it to anyone wishing to start in the hobby of Metal Detecting, as a great starter detector. After visiting here, you can click on the MongoBay.com logo above, to visit his site. He has a great site and forums to do research on metal detecting. Check it out when you get the chance. Thanks. Click on any of the awards below to visit their sites. Thank you Bill Ruppel for the award. Thank you Ernie Marsh for the award. 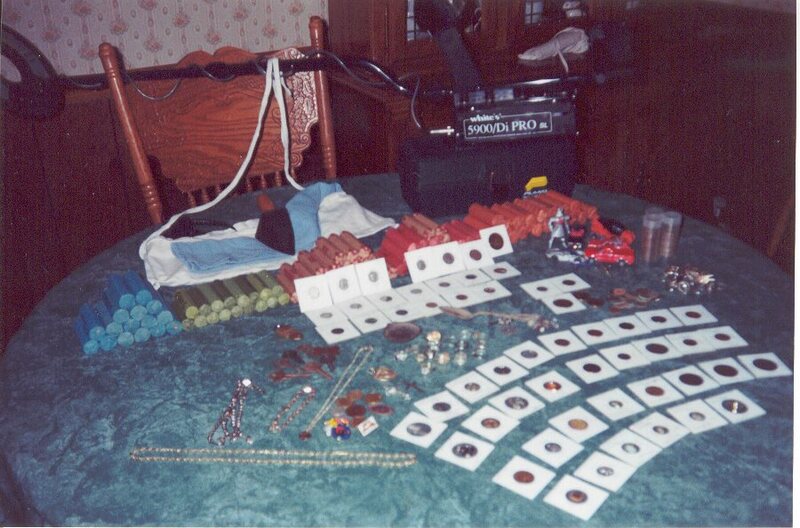 This is a picture of my finds since I started metal detecting on April 17, 1999. Picture taken Febuary 23, 2001. This site was established July 10, 2001. Counter reset to 10,000 November 29, 2003. Hi to all metal detectorist. If you have a Metal Detecting/Treasure Hunting site and would like an award, just e-mail me and I'll send you one. Thanks.